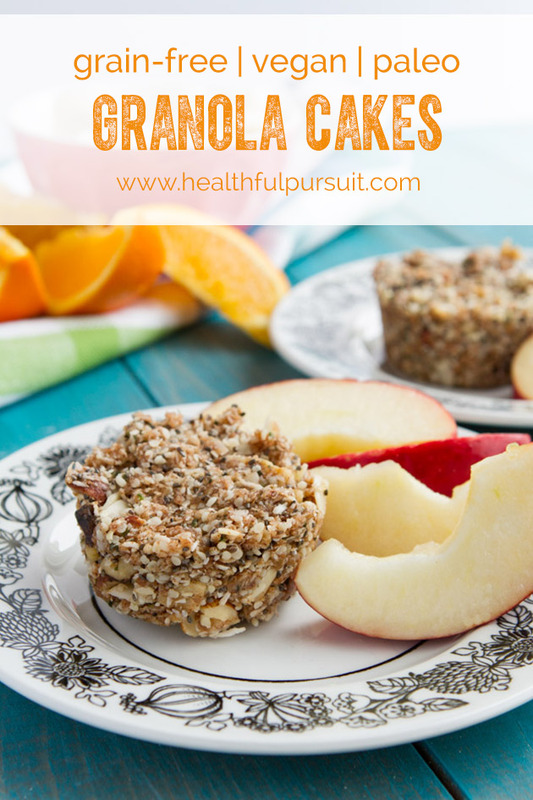 High protein, grain-free granola cups filled with healthy fats – a healthy, low carb, low sugar, portable snack. Kevin loves snacking. The man is always hungry! He used to make oatmeal for himself a couple of times a day to hold him over, but since going grain-free with me, his go-to snack has become microwaved bacon. Bacon has its time and place, but bringing balance to Kevin’s daily eats, isn’t one of them. Last week, we received a huge package of raw goodies from our friends at The Raw Food World. In the package, was a bunch of raw nuts! Macadamia nuts – high in antioxidants for cleansing power, cashews – great source of magnesium for strong bones, and pecans – to aid digestion aka avoid constipation. 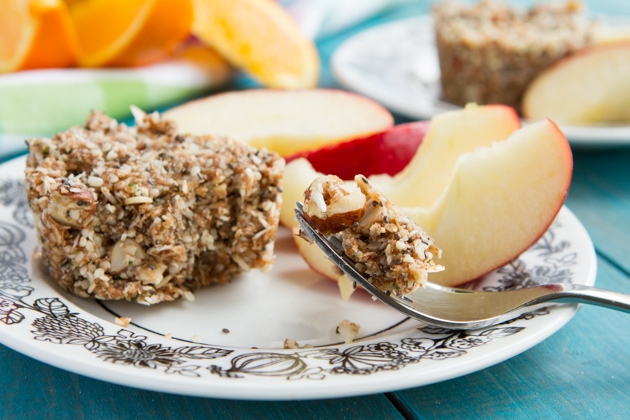 Kevin had the idea of combining all of these powerful raw goodies into a bacon-free treat. 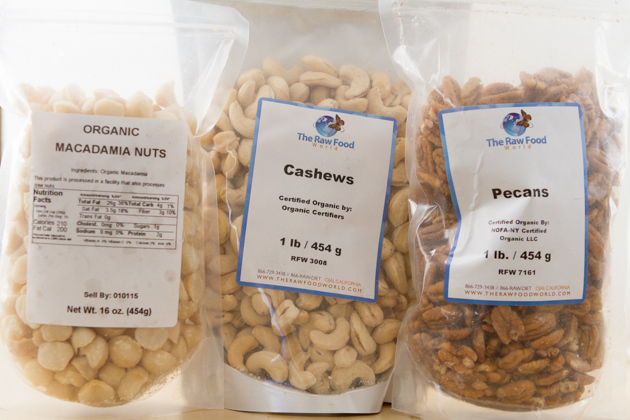 Just look at how fresh and delightful the raw pecans are from The Raw Food World. 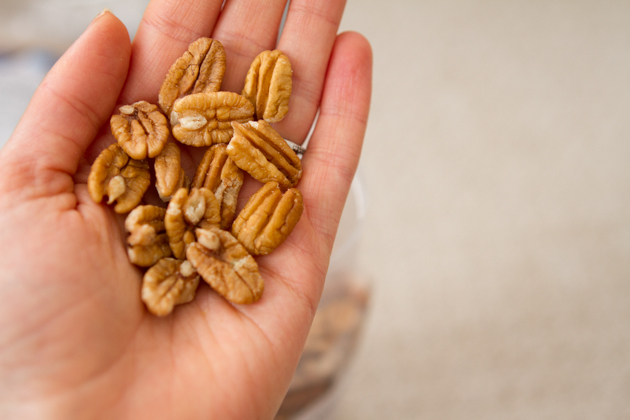 They are unlike any other pecan I’ve tried. Combined with the little, bitty hemp seeds, chia, almond butter, boy, these little guys are delicious! 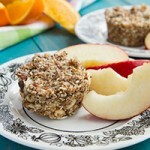 High protein, grain-free granola cups filled with healthy fats. 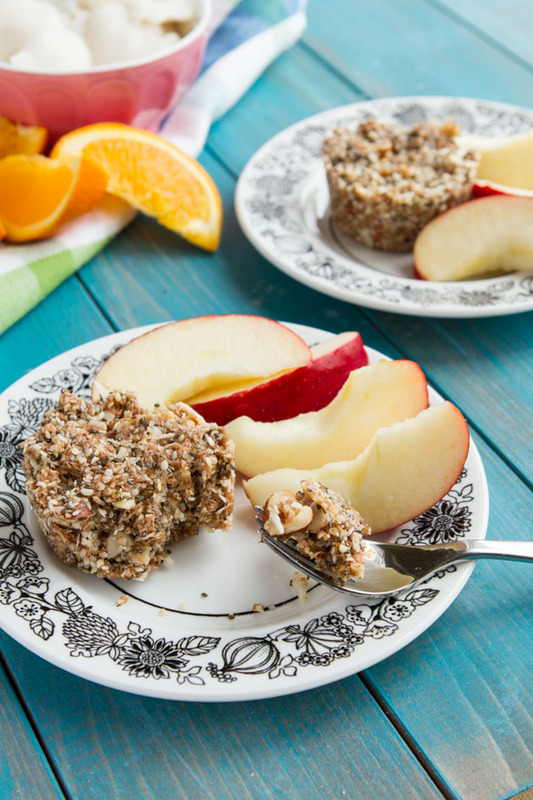 Take along with you for a healthy, low carb, low sugar, portable snack. 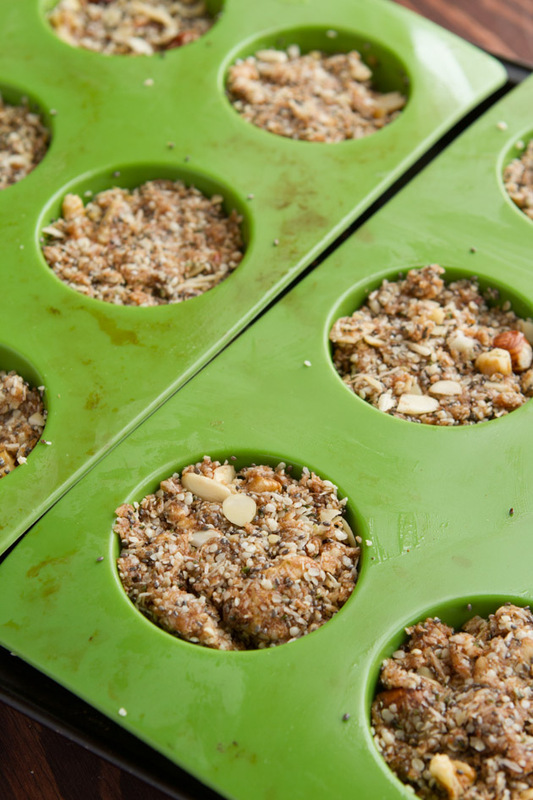 Place a BPA-free 12-cup silicon muffin tray on a baking sheet and set aside. You could try to make this recipe in regular muffin tins with paper liners, too. Chop nuts into small pieces, about the size of a sunflower seed kernel. 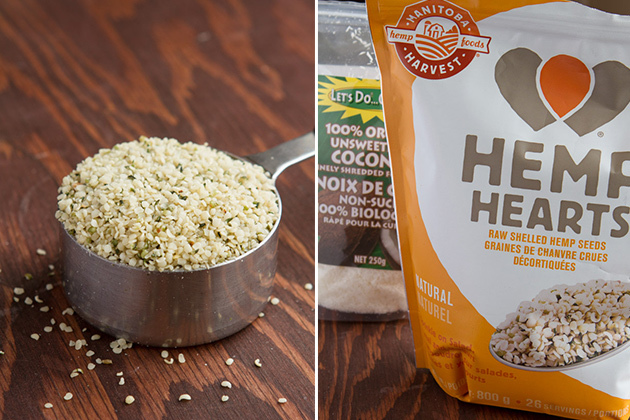 Add to a bowl with hemp seeds, coconut, protein powder and chia seeds. Set aside. Add coconut nectar to a large frying pan. Heat on medium-low heat, constantly stirring, until bubbles form. Add almond butter. Bring back to a bubble. Add remaining ingredients, cinnamon, vanilla and salt. Stir to mix. 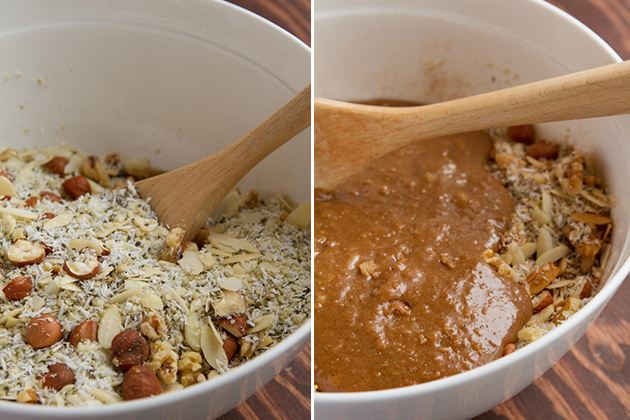 Pour coconut nectar mix into nuts bowl and quickly stir to coat. You will want to move fast here as the coconut nectar mixture hardens quickly. Divide the mixture into the muffin cups. Press down firmly. Transfer tray to fridge to cool for 1 hour. 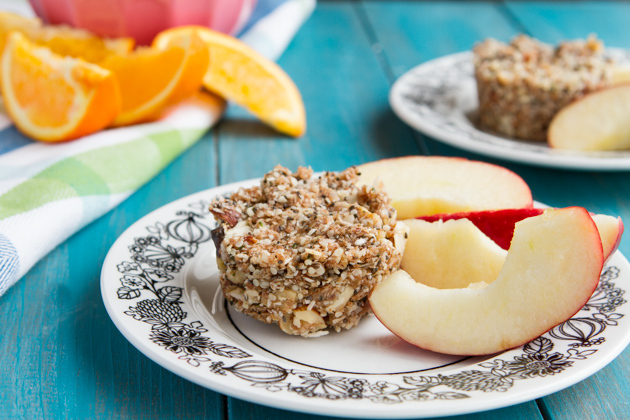 Remove from muffin tray and store in an air-tight container in the fridge for 1 month or freezer for 3 months. They are a tiny bit flaky, but nothing too crazy. Just add everything into a bowl, give it a good stir until combined. Press into your silicon tray and away you go! Kevin and I love making these together – he chops the nuts and gets the dry ingredients ready, I boil everything, mix it… and he eats from the bowl almost quicker than I can fill the cups. Do you bake with your significant other? What’s your favorite thing to make together?